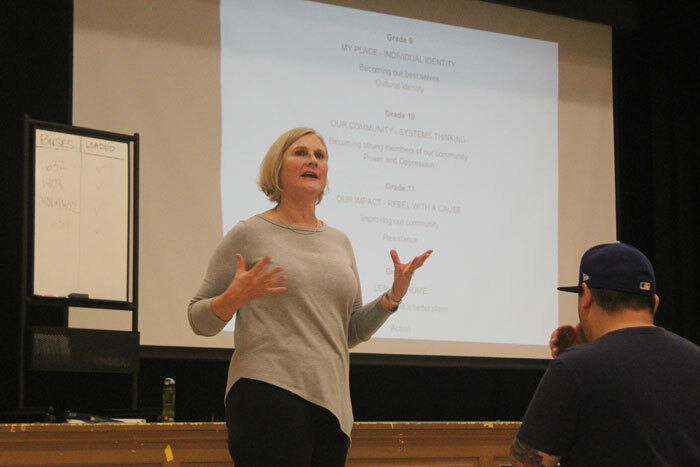 Photo by Joe Livarchik: Lincoln High School principal Ruth Medsker updates community members about planning for the school’s reopening during a meeting at John Marshall School on Monday, Oct. 1. Hundreds of community members filled the gym at John Marshall School last week to hear an update on the reopening of Lincoln High School, which is set for next fall in Wallingford. A $93 million modernization project of the school is underway, funded by the school district’s Building Excellence IV and Buildings, Technology and Academics IV capital levies. Lincoln originally opened in 1907, and closed in 1981. The school has served as an intermediate for other schools and programs since 1997. Those in attendance were able to meet the school’s current staff members, receive an update on academic programming, learn the transition plan for freshman and sophomores, and plan for athletics and activities. “I have the privilege of opening the first high school in Seattle since 1963,” LHS principal Ruth Medsker told those in attendance. The school will open in 2019 with grades 9 and 10. The next year, Lincoln will have grades 9-11, and then will become a comprehensive high school with grades 9-12 in 2021. Incoming Lincoln students are currently attending Roosevelt and Ballard high schools. To address overcrowding in Seattle’s north end, boundary changes set to take effect within the school district next fall and will affect some ninth-graders currently attending those schools. Students entering 11th and 12th grade in 2019 won’t be affected by the change. Lincoln will have space for 1,600 students. In 2019, the school is expecting to serve 600-750 students, assistant principal Corey Eichner said. The school is planning on bringing back its historical red and black colors, as well as an updated version of its Lynx mascot. Educators specializing in various subjects were on hand at Monday’s meeting, including teachers for math, science, language arts, social studies and world languages. Teachers for visual arts, performing arts, music, band and orchestra were also available to meet with parents. Eichner told the audience the school plans to offer a full slate of athletics and activities, which will take shape over time. Medsker said Lincoln staff members were currently working “two jobs,” as they’re now working at other schools in Seattle or neighboring districts while also preparing for Lincoln’s opening during their off-hours. Educational consultant Charity Allen helped with the design of Lincoln’s educational programming. She said much of the challenge in general at comprehensive high schools is that much of the work students do is segmented and compartmentalized. Students learn math in math class, science in science class, and those experiences aren’t usually connected. At Lincoln, staff will be working toward structuring student learning experiences to create more continuity from class to class. Lincoln staff collaborated to create a concept of a whole-school annual theme of “true cost” for teachers of different courses, subject areas and grade levels to implement in their classes. The goal is to better connect academic learning at the school. Using coffee as an example subject, a student trying to find the “true cost” of coffee could examine the math behind the expenditures of buying daily coffee and analyze coffee consumption numbers. For science class, they could research the environmental impacts of different brewing methods, what creates the most waste, and what generates the most shipping and fuel costs, while establishing continuity between both classes. Eichner said Lincoln staff was in the process of trying to help students with the transition process for next fall. Staff visits have been made at Roosevelt and Ballard, as Lincoln has been trying to create visibility in their feeder schools to help with student transition.